What do you prefer to eat for breakfast? 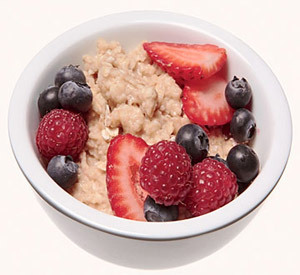 Ever try a warm bowl of oatmeal with some fresh fruit? Oats provide the body with many benefits. Oatmeal is a whole grain, and by eating whole grains, you can lower your risk for several diseases that include high blood pressure and type 2 diabetes. When purchasing oatmeal, avoid prepackaged oatmeal that may be high in both sodium and sugar. Your food label on your package of oats should list one ingredient: whole grain oats. Oats are also a great source of iron, magnesium and B vitamins, and it can also help in lowering your LDL, or “bad” cholesterol! Oatmeal is also a great source of fiber, which means that you’re going to feel full for a longer period of time, as opposed to eating breakfast foods that are high in sugar and fat. Not a big fan of plain oatmeal? I have to admit, I'm a cereal junkie and giving up sugary cereal has been one of my greatest accomplishments! In the past, if I ate oatmeal, it was the prepackaged Maple and Brown Sugar flavor! 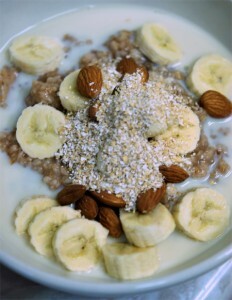 Although I tend to drink my Shakeology for breakfast, I do try and switch my mornings up and eat some oatmeal instead. There are tons of ways to make it better! You can add fresh fruit or spices like cinnamon and nutmeg to give it great flavor. I usually cook my oats in the microwave with some water and then add all of the yummy ingredients! As I expand my oatmeal recipes, I will be sure to add them in! Here are a couple that I have already tried and love!